L.P. N.P.C.? What's It Mean To Me? Large polyp non-photosynthetic corals are becoming more and more popular as information continues to spread regarding their relatively easy care. We’re not to the point where they’re a ‘set and forget’ coral, however with many main stream prepared foods available on the market today it’s becoming less of a chore and more enjoyable to house these types of coral. Since large polyp non-photosynthetic coral is quite the mouth full I’ll be addressing them by the acronym L.P. N.P.C. from here on out. Basic Care Introduce L.P. N.P.C. 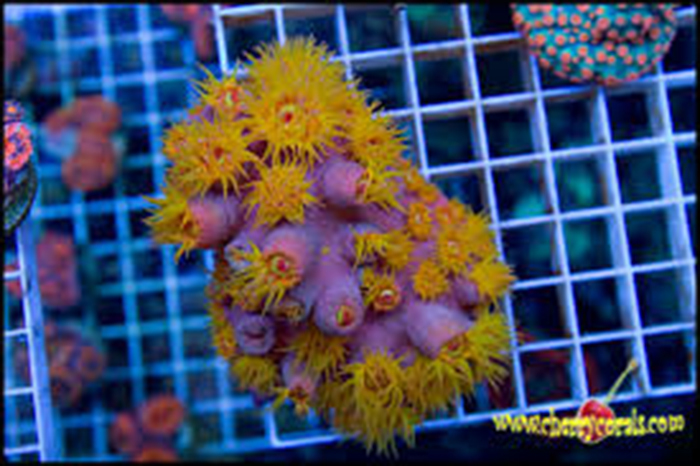 to your aquarium as you would any other coral, inspect for pests, and dip accordingly. There are several predators that feed exclusively on certain L.P. N.P.C. 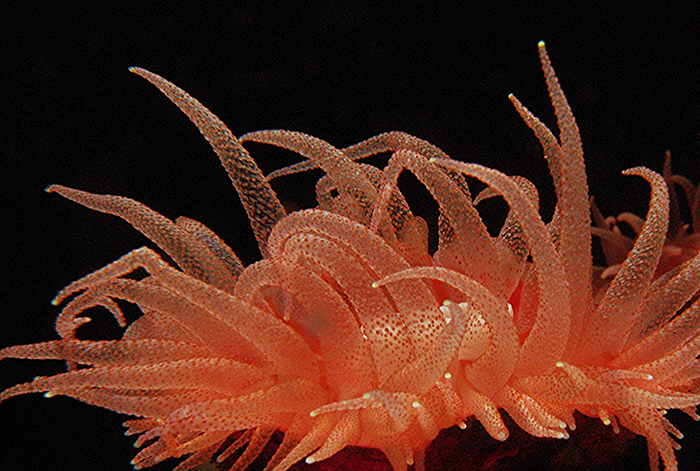 coral such as nudibranchs and snails, and the predator will sometimes retain the color of the species they eat making them difficult to spot. As with any animal we introduce I highly recommend a rigorous quarantine protocol. 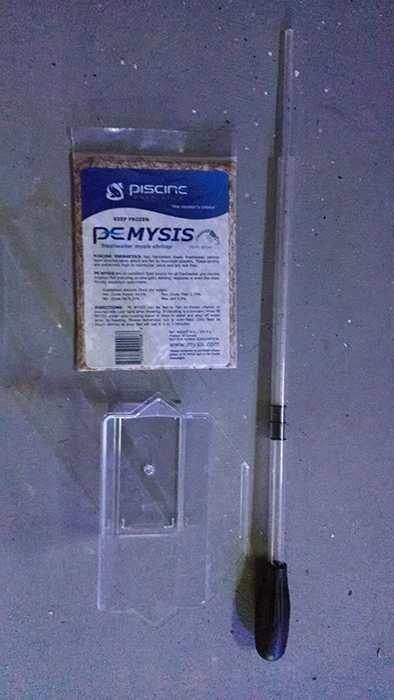 After allowing specimen to settle in for a couple days add a small amount of food and see if the polyps open. If they open, feed them! Keep in mind that the polyps do not need to be fully extended. If you see even one tiny tentacle peeking out of the coralite, feed it small prey items. The polyp will begin to fully expand in due time. Spot feeding can be performed with a Kent SeaSquirt (with gray tip removed), turkey baster or eye dropper. 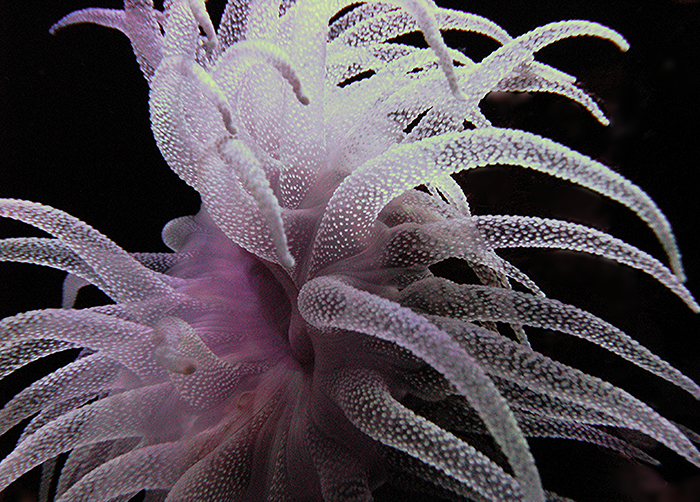 It is important to attempt feeding every polyp, as its thought that the colony only shares stored energy. L.P. N.P.C. store Nitrogen and Phosphorous within the skeletal body, which is one way they survive long transit times or lack of food in the wild. Spot feeding may seem tedious, but you will develop a routine that should only take a few minutes. Feeding tools of the trade. Note tip removed from SeaSquirt. Most L.P. N.P.C. only require direct feedings two to three times per week once conditioned to aquarium life. Of the many foods available today my main staples are still frozen meaty foods such as P.E. Mysis shrimp, Hikari Krill and more recently LRS Reef Frenzy. However I have had superb results with other prepared foods that may be easier to feed such as Fauna Marin LPS pellets, NLS pellets and Azox Macro diet. The latter foods require little to no preparation compared to frozen offerings, although I do let pellets soak in saltwater until they all sink. At this time you can use a small diameter PVC tube (1/2” works well) and simply drop pellets down the tube while aiming at the coral. 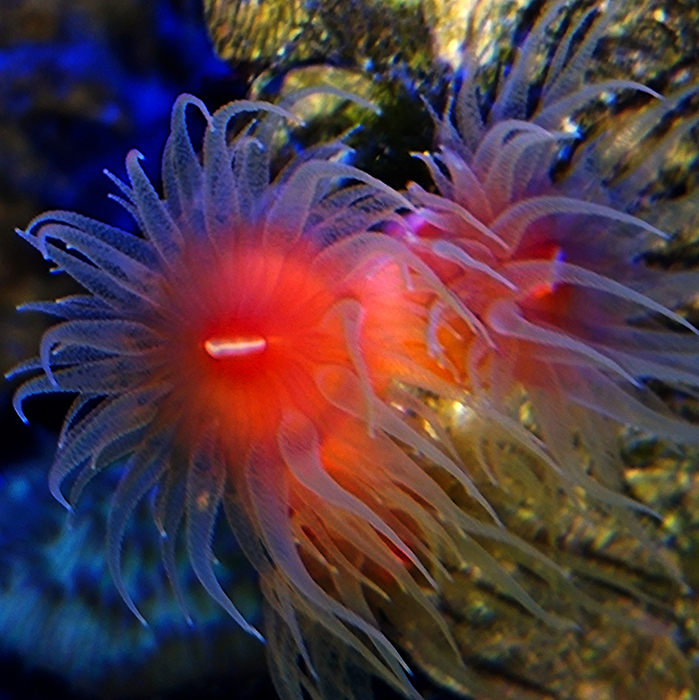 Although these corals must be fed, they can be overfed. I do not recommend feeding most of these corals more than three times per week. They need time to properly digest the incredibly potent food we have just spoon-fed them. Overfeeding can result in foods rotting in the gut which will result in the demise of the polyp, and possibly cause issues with the entire colony. Become familiar with the potency of the foods you are offering as some of the newer pellets are surprisingly rich. A common misconception regarding LP NPC is that they must be kept in the shade. L.P. N.P.C. are generally outcompeted by fast growing photosynthetic coral in the wild making them more commonly found in deeper waters. With that said I have seen Tubastraea faulkneri while diving with polyps fully open in direct sunlight in less than ten feet of water. In nature these corals are obviously not spot fed by a turkey baster, they rely on zooplankton and other small critters to feed on which begin to swarm on the reef after sunset. This is why most newly imported L.P. N.P.C. will only extend their polyps at night. On that note however, some N.P.C. 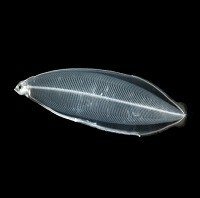 can sense light (Balanophyllia spp., for example). Any coral that is light sensitive should be kept in a very low light tank or under overhangs so you can still enjoy the beauty of them when polyps extend. Tubastraea sp. 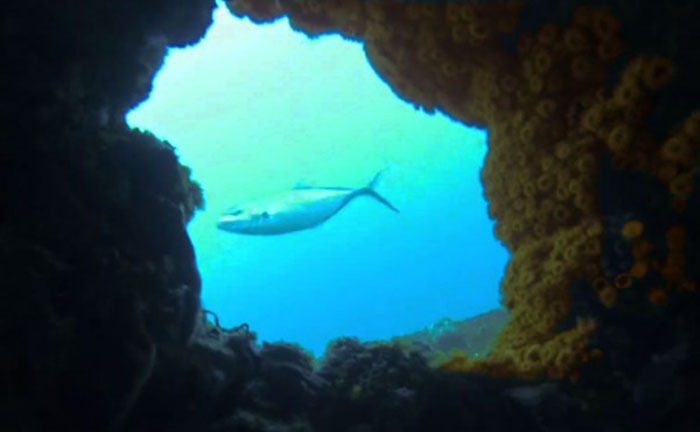 encrusting window opening on Bibb wreck off the Florida Keys. Flow is just as important to these corals as any, bringing them food, oxygen rich water and keeping them free of detritus. In hobby terms ‘moderate flow’ could be used to best describe their ideal flow rate. You’ll want the polyps to be moving fairly well in the water current consistently, but not being blown over like in a hurricane. I have had a polyp of Dendrophyllia sp. tear at the polyps’ base that was placed in too much flow. Conditioning Conditioning L.P. N.P.C. to aquarium life is one of the most asked about topics I see regarding NPC, and there is no doubt that it can be quite a chore depending on species and coral health when acquired. Before considering purchasing L.P. N.P.C. it’s crucial to realize the care requirements you’ll be in for right off the bat. We have to remember that these corals are incredibly stressed out when we initially receive them since they’ve just been collected by a diver, taken/shipped to the exporter, shipped to the wholesaler/importer, then shipped to the retailer where they often sit a considerable amount of time, and are finally bagged up and taken home. Generally during that entire period they are never fed, leading to them being emaciated by the time we receive them and polyps reluctant to expand. 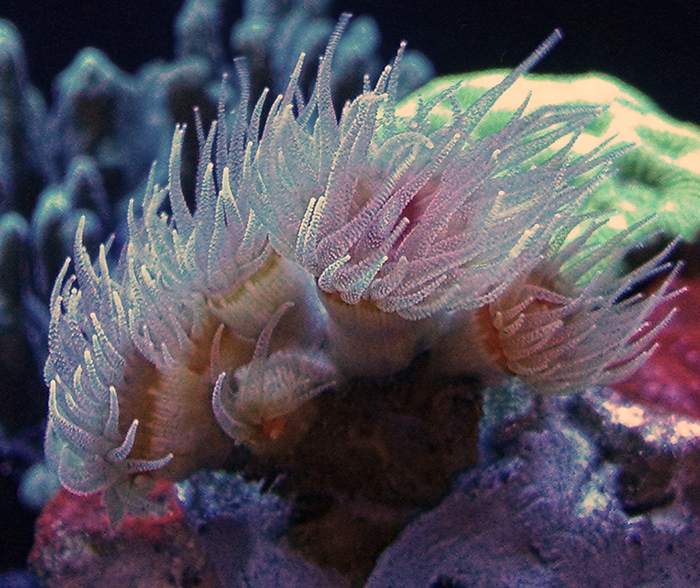 If polyps don’t open after a few days you’ll want to take action to get nutrients to the coral as soon as possible. It’s now time for what I call the “Tupperware Method.” This involves removing the colony from the tank and placing it into a small container with water from the main tank. 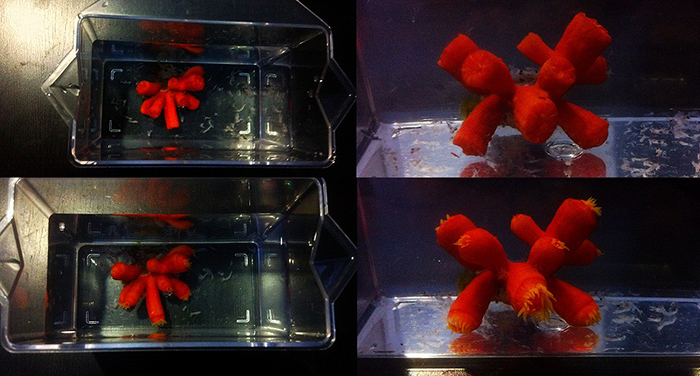 Place some food in the container such as brine shrimp, Cyclops or some mysis shrimp, and then gently stir. Let the coral sit in the container for at least fifteen minutes and watch for the polyps to start expanding. If they do extend, feed them! If not, add a bit more food to the container and wait a while longer. 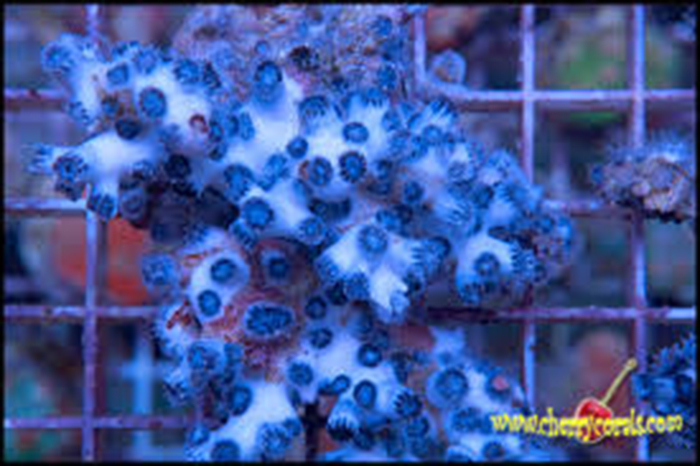 Keep in mind if you move the coral or container at all while waiting, the polyps will likely not extend for you. I’ve let a colony sit for well over an hour soaking in a container with no ill effect, however generally polyps will open after fifteen minutes or so. 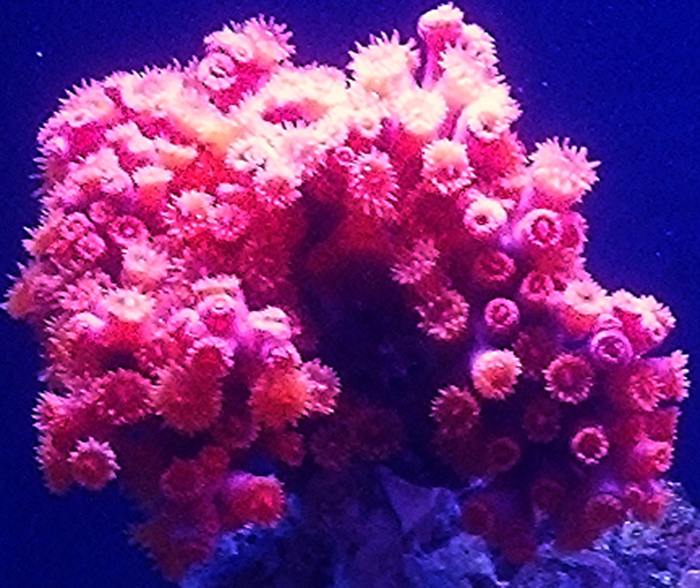 If for some reason the coral doesn’t extend its’ polyps at all, gently shake any food off the coral, remove from the container and place back into the aquarium. Try again in a day or so and eventually it will open for you. Generally the “Tupperware Method” only needs to be done for a couple weeks, at which point the coral should begin extending polyps in your display aquarium. Commonly offered genus of L.P. N.P.C. Tubastraea sp. Photo by Cherry Corals. Tubastraea is the most readily available genus of L.P. N.P.C., with several species being offered. Tubastraea tends to be a more difficult genus depending on species and colony condition. They should be fed at least twice per week, with some species faring better with more frequent feedings. While most species require similar care, it should be noted that Tubastraea micrantha does prefer higher flow rates than most. Dendrophyllia comes in a close second in regards to availability, although they are becoming scarce in the trade as of late. They tend to be easier to adapt to captivity than Tubastraea but require nearly identical care. Dendrophyllia and Tubastraea can be incredibly difficult to differentiate. Balanophyllia spp. requires care similar to that of Dendrophyllia. These corals are surprisingly light sensitive compared to most L.P. N.P.C., and should be kept shaded. Full polyp extension is most commonly seen when lights have been off for around an hour. Rhizotrochus typus is a species that had been rearing its head fairly frequently for a few years in the trade but have since almost vanished due to no CITES permits being offered rendering their import illegal. The same can be said for the incredibly scarce Monomyces rubrum. Both require care similar to other LP NPC but can handle more food at one time with fewer feedings required. Cladopsammia gracilis has been making its way into the industry lately although unfortunately it’s most frequently labeled “Sun Coral”, as many L.P. N.P.C. species are, resulting in misinformed consumers believing their care will be similar to that of Tubastraea or Dendrophyllia spp. These corals are considerably more time consuming, necessitating feeding at least once per day and can take months to settle into captivity. They seem to do best in cooler water while being offered finely chopped meaty foods. Arcohelia rediviva. Photo by Cherry Corals. Arcohelia rediviva is another L.P. N.P.C. that has been available from time to time. They seem to do better in cooler temperatures while being offered finely chopped meaty foods. 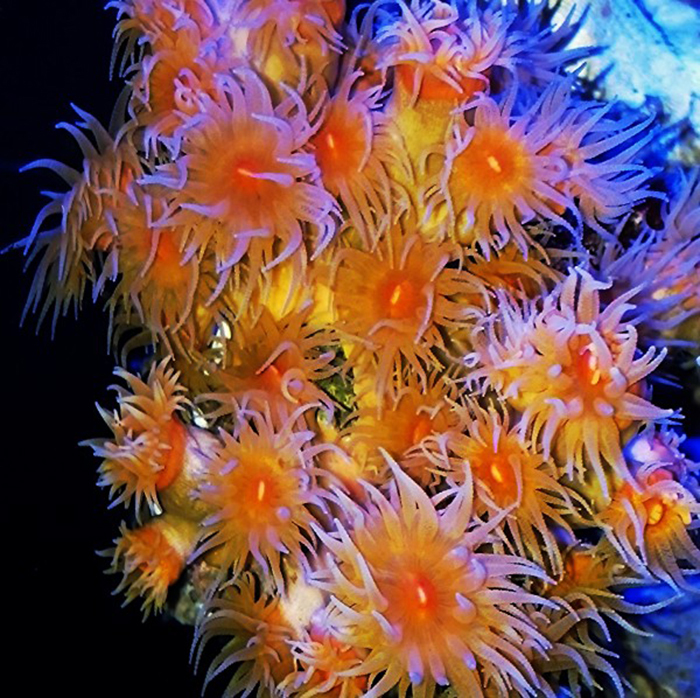 Their polyps are considerably smaller than most of the corals discussed here, but overall care is very similar. Generally speaking all L.P. N.P.C. warrant similar care which if provided will result in a thriving coral. Identification of any coral can prove daunting. In the end a healthy coral is what really matters.